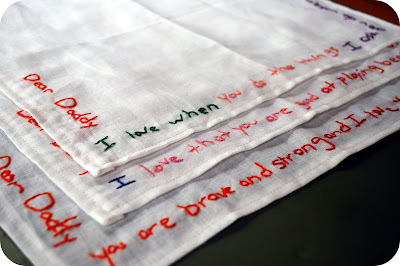 This was my father's day gift to Mr Beeper--3 handmade linen handkerchiefs, embroidered along the edge with Beeper's own words, in his own writing (sort of--I mean, half his writing, half mine, really, since Beeper doesn't yet know how to write --you see, I wrote the words in yellow marker that he dictated to me, and then he traced over them.) The note really happened first--as its own initiative a couple of weeks ago while Mr Beeper was away on a camping trip. 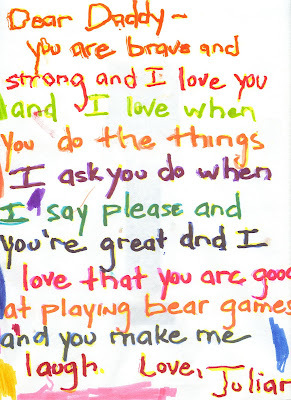 I just offered to help Beeper write a note to Mr Beeper for father's day and he eagerly took up that task--dictating word for word what you see above with no input from me, then tracing over my writing in a variety of felt tip maker colors (everything is multi-colored in Beeper's world lately, every thing he writes or colors looks like a rainbow threw up on it--which I only mean in the most loving way because I do think it is friggin adorable). And then I had this totally seperate kind of stupid idea that I would make Mr Beeper a tie--yes, a neck tie, even though Mr Beeper only has occasion to wear a tie like once a year. 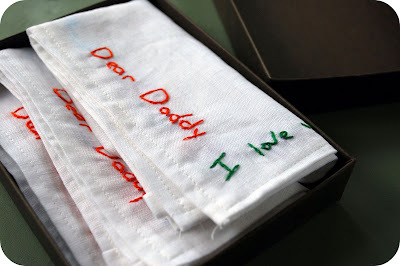 But it seemed so Father's Day appropriate and then I actually saw a tutorial on how to make one on The Purl Bee. But good sense finally overcame me and I realized I should make him something he could actually use--because Mr Beeper is above all other things practical and sensible (hence the reason why I own a Volkswagon Jetta today and not the Mini Cooper that I really, really wanted--but that's another issue...). 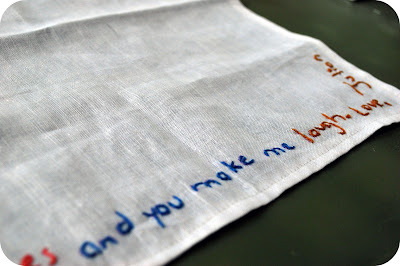 So, handkerchiefs. The marriage of Beeper's sentiments, and my handiwork--in a rainbow of colors, ala Beeper mode. Perhaps it does not seems so sweet to sneeze into something made so lovingly for you, but I don't care because when I decided to make these I only envisioned Mr Beeper keeping one of these in his pocket, hidden there much of the day, unearthed for a sneeze (and if you knew Mr Beeper, he is sneezey--allergies), but then the unexpected smile the sight of these words might bring to him, the little lift of love from me and Beeper, wherever Mr Beeper might be. Happy father's day, B. We sure do love you. These are perfect. What a beautiful idea. You almost made me cry (or at least Beeper did)! I don't think I could use them, but having one in my pocket to look at when I wanted would be wonderful. What a great idea. I love these. They are so great! could you guys be any sweeter? 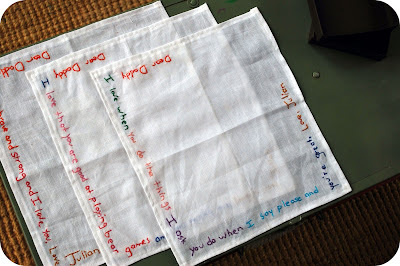 Okay...now, please tell me...how did you do these hankies? Do you need an embroidery machine? There is almost none of your skills in me...but what an awesome gift for DH from his kiddo. So I thought I could at least try.